A 51-cent stamp issued in 2003 features Fay Wray’s portrait alongside a scene from King Kong. On today’s date in 1933, the film King Kong, starring Canadian actress Fay Wray, opened to rave reviews at theatres in New York. King Kong premiered at Radio City Music Hall and Roxy Theatres on March 2 of that year. Nearly six decades later, in 1991, the movie was deemed “culturally, historically and aesthetically significant” by the U.S. Library of Congress and selected for preservation in the National Film Registry. With 54 reviews and a 98 per cent “fresh” rating, the film is currently listed as number four on Rotten Tomatoes‘ Top 100 Horror Movies and number 29 on its Top 100 Movies of All Time. Wray, who was born in 1907 Cardston, Alta., played Ann Darrow in the 1933 flick. Darrow is kidnapped by a group of natives and offered to the gigantic, pre-historic, island-dwelling ape named Kong. 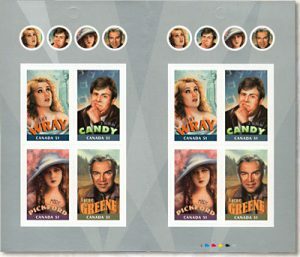 A commemorative pane of four gummed stamps features (from left to right) John Candy; Wray; Lorne Greene; and Mary Pickford. 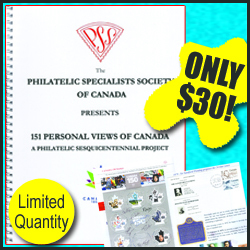 In 2006, Canada Post featured Wray on a 51-cent stamp (Scott #2154c) as part of its Canadians in Hollywood issue (SC #2154). 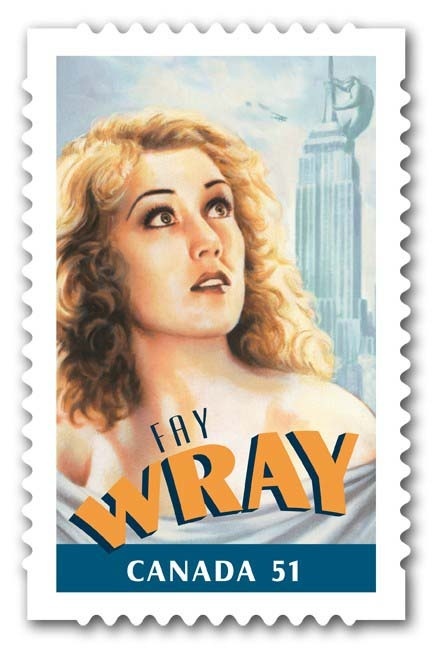 The Wray stamp features the iconic actor’s portrait alongside a scene from the movie that defined her career, King Kong. 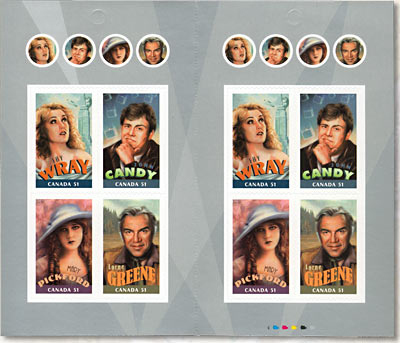 Also commemorated in this issue were John Candy (SC #2154a), Mary Pickford (SC #2154b) and Lorne Greene (SC #2154d). Best known as the heroine in the hands of the infatuated ape Kong, Wray also starred alongside Gary Cooper, Joel McCrae and Henry Fonda. A commemorative folder was issued with two stamps of each of the four actors and 12 miniature seals. During her childhood, Wray moved to Arizona with her family; however, by the age of 14, she went to California with the hopes of starting a career in film. 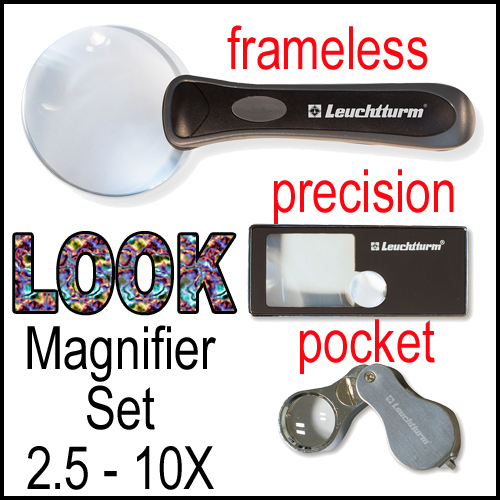 It wasn’t long before she began picking up small parts in westerns and comedy shorts. In 1926, Erich von Stronheim cast Wray as the female lead in The Wedding March, which was her own all-time personal favourite role. She then played opposite Cooper in the war drama Legion of the Condemned and was re-teamed with him for 1928’s The First Kiss. But it was the classic “beauty and the beast” film, King Kong, which secured Wray’s place in film history.